Labels completely cover up what is underneath. Label color matches the color of most shipping boxes, delivering a printed on look. Logos, marketing messages and addresses look like they were custom printed. Compatible with major internet postal service software. Ideal for use on corrugate boxes, large mailing tubes and packages. Labels completely cover up what is underneath, so shipping containers can be reused while still looking professional. 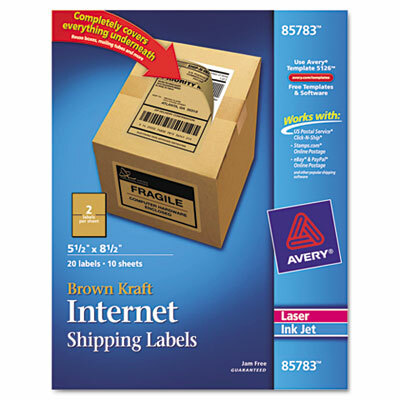 Label color matches the color of most shipping boxes, delivering a printed on look. Logos, marketing messages and addresses look like they were custom printed. Compatible with major internet postal service software. Permanent adhesive sticks and stays. Ideal for use on corrugate boxes, large mailing tubes and packages. Laser and inkjet printer compatible.